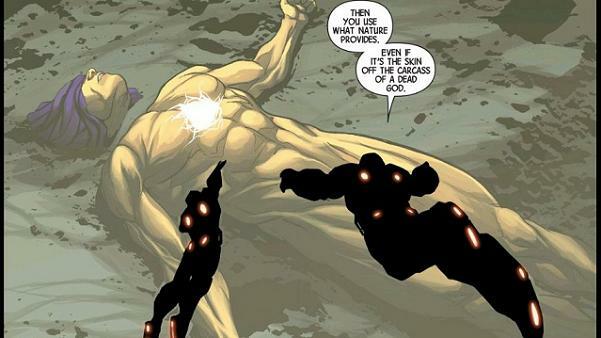 This week’s Avengers recovers a lot of buoyancy lost over the last couple of installments. 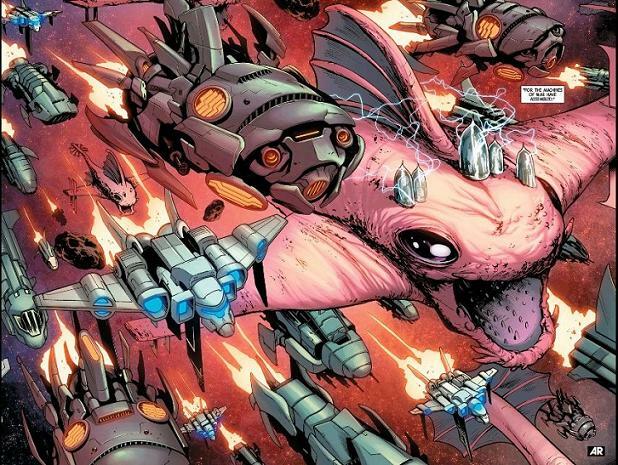 Packed to the gills with scene changes and cast galore, Jonathan Hickman goes into overdrive crunching Marvel’s multiverse toward the Summer 2015 Secret Wars. With his run on Earth’s Mightiest wrapping in April, the writer’s renewed urgency is ably accompanied by some of artist Stefano Caselli’s strongest work. It’s such a well-paced visual delight that you almost forget a coalition of intergalactic empires is heading to Earth to pre-emptively end it. If there’s any hold-over from the late bout of leftfield clunk, it begins and ends with the cover. Scott Koblish is a surprise choice with a lack of Avengers, X-Men or Marvel Cosmic clout. Although an industry veteran, he’s mostly known as a Deadpool guy these days. His greatest credit is probably illustrating the cover to “The Wedding of Deadpool” issue. As such, he can really cram ‘em in there George Perez kitchen sink-style. So points there, however his expressively cartoony style comes off more as a cluttered collage than properly showcasing the weighty and righteous “cast of thousands”. Cover colorist, Romulo Fajardo, brings the intensity full-force, though, operating with an incredibly super-vibrant palette. The cover’s onrushing horde of angry aliens belies the actual issue’s less-than-straightforward narrative. It’s not an outright feint as there is a lot of ground to cover, a great deal focusing on the Shi’ar Imperial Guard themselves. Owning the most page-time, the Guard individually and collectively wrestle with the ethics of their situation, demonstrating that Shakespearean drama isn’t wholly a terrestrial domain. Majestor Gladiator’s head has never been heavier while Brainiac-5 analog, Mentor, has never been more like C-3PO (not becoming, man). The very crux of the crisis also results in a juicy plot point snarl for Smasher, undoubtedly resolving next issue. If there’s a thematic tie through the twenty pages of terse locale hopping, it’s all about showcasing who else can sit at the Illuminati’s “big brain” table when the chips are down. Gladiator’s presence as warrior-emperor pervades all of his panels. In this, he is for the moment still the “Before” picture compared to regals Black Panther, Namor and Black Bolt. 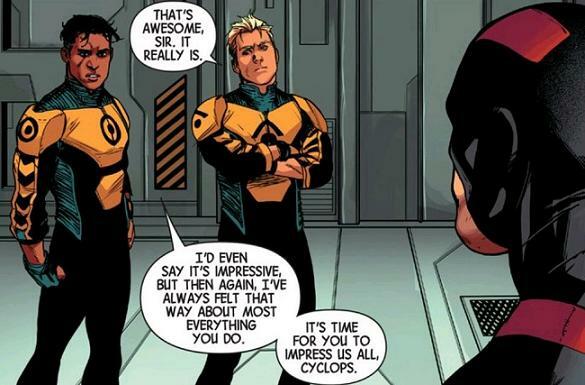 Sunspot also continues his steady assertion as a positive young leader. No longer the brash upstart of original New Mutants fame, Roberto daCosta’s growth to responsible maturity is an ongoing welcome development. His method of socially-minded corporate authority paints him as a much lighter reflection of Tony Stark’s recent selfish endeavors. He and BFF Cannonball are probably Hickman’s greatest value-adds since taking over the franchise, never at a loss with their tag-team comedic observations. They also hand out some shaming to one of their former idols, foreshadowing a certain late-in-the-game wild card. 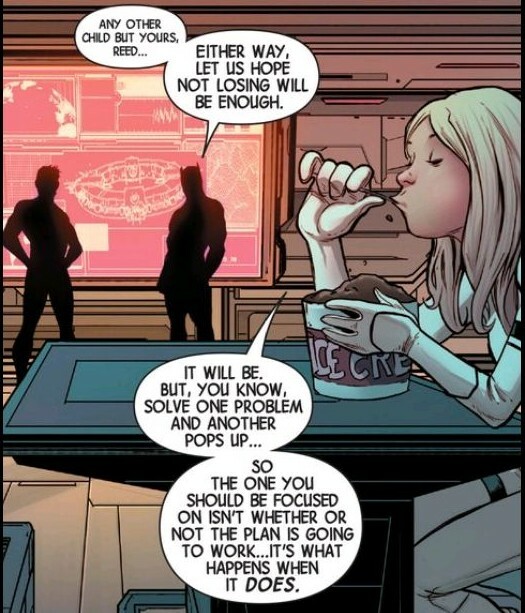 Rounding out the think tank next-gens and also-rans is Valeria Richards, making no secret that there’s pretty stiff competition in the Fantastic Four’s resident genius department. Since his time writing them on a monthly basis, Val seems to function exclusively as Hickman’s true protagonist/mouthpiece, one step ahead and privy to his notebook. This issue is no exception as the wunderkind gives voice the most damning of solutions with childlike innocence. More than Mister Fantastic and his unscrupulous Ultimate Universe double, Val is sure to be a crucial must-watch factor as all parties converge in Secret Wars. Wonder if this is how toys feel? Hmmm…. All of this being said, at the intersection of big braininess and apocalyptic high drama, there’s still a momentary disconnect with logic for sake of telling desired story beats. Outside of being coincidentally similar to the mysterious ring formations the Beyonder used to scoop up all the heroes and villains to the original Battleworld in the original 1980s Secret Wars, Reed and T’Challa’s “solution” is less than satisfactory. 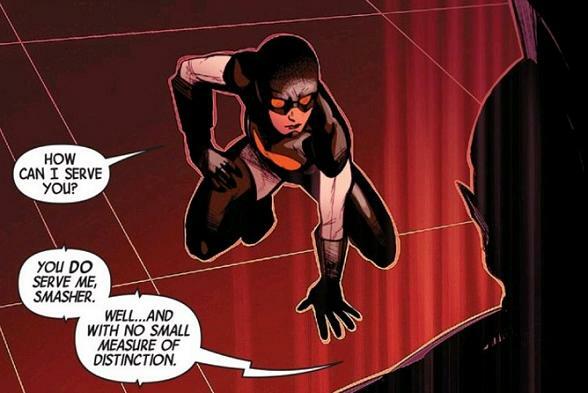 If space and resources are considerations, what thought did they give to shrinking the population via Pym Particles? Instead it’s jumping straight to this self-appointed utilitarian lottery system of who lives and dies on a global level! Steve Rogers will not abide. Before any of this comes to a head, it all circles back to the incoming alien fleet and the real treats of the issue. Aside from breathing some much needed life into the usually stiff and two-dimensional Imperial Guard, Hickman and Caselli truly excel at handling the Guardians of the Galaxy. It’s too bad Secret Wars is the writer’s last Marvel offering before taking a hiatus because there seems to be some real affinity for the blockbuster unit. 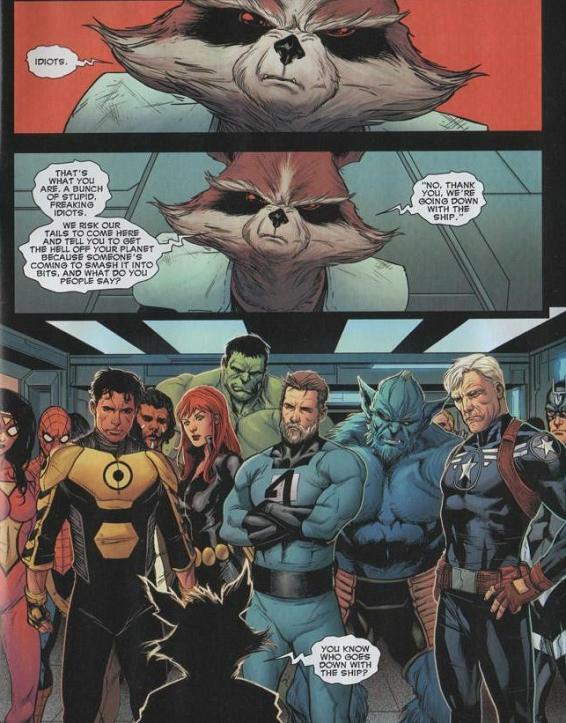 Rocket also delivers a segue speech that is positively the quote of the issue. Heroes standing up as raccoon delivers snarky speech? Check. In sum, this issue has all the earmarks of a classic “end of the final season” ramp-up episode. As much as Jonathan Hickman loves to sprawl a story out for eons, “It All Comes Crashing Down” is fantastic proof that he can execute tight, poignant “revolving cam” action just as well. In a book divided into eight scenes, only one (intentionally) felt like the “B” plot. 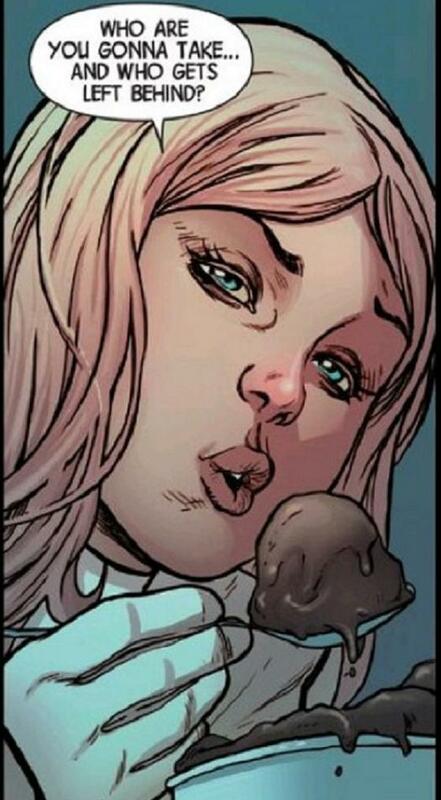 Secret Wars will be well-served following in kind. Bring on Battleworld! Structurally, this story’s shaping up a lot like the Death of Johnny Storm in “Three”- that same everything & anything coming outta the woodwork at the very end effect! The “Battle” in Battleworld involves mass breakdance fighting! Also, considering Reed & T’Challa’s “can’t take everyone” mindset w/the lifeboat (not looking so good for Storm, eh? ): do they take David Bowie, the Rise and Fall of Ziggy album or just the super-appropriate song “Fiver Years”? I had my monthly “dammit, I need to read all these issues again – again!” moment reading Avengers #42. I really appreciate the balls hickman’s keeping in the air right now, but the Shi’ar focus gives me pause every time. We’re two months out and Smasher’s suddenly at the forefront? Bold play, Hickman, bold play. Otherwise, the only thing I appreciated more than your pithy C3P0 diss (take that Mentor!) 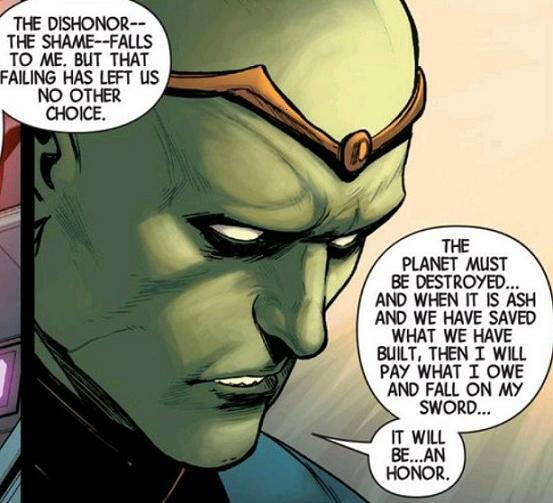 was Hickman’s use of Guardians of the Galaxy. The weight of his work is always going to overshadow the fact that he’s a really funny Marvel writer. I always think of the Human Torch / Spidey “FF” roomies issue as evidence. He nails GoTG and Rocket in, I think literally, 2 pages. Great touch this issue. I simultaneously want 100 more issues of Avengers/New Avengers (Ultimate Reed and the Cabal are relegated to “Hey we’re here!” panels and that just isn’t enough), and can’t wait for Secret Wars. Bring it on, indeed.